Austrian actor; born at Vienna Nov. 11, 1845. His father was a broker, and destined his son for the same career; but Pagay preferred the stage, and began as a chorus singer, going subsequently to Linz and Odessa, where he sang comic parts in operettas. He then traveled through Austria-Hungary and southern Germany, and in 1887 accepted an engagement at the Residenztheater, Berlin, where he now (1904) occupies a noteworthy position as a character actor. 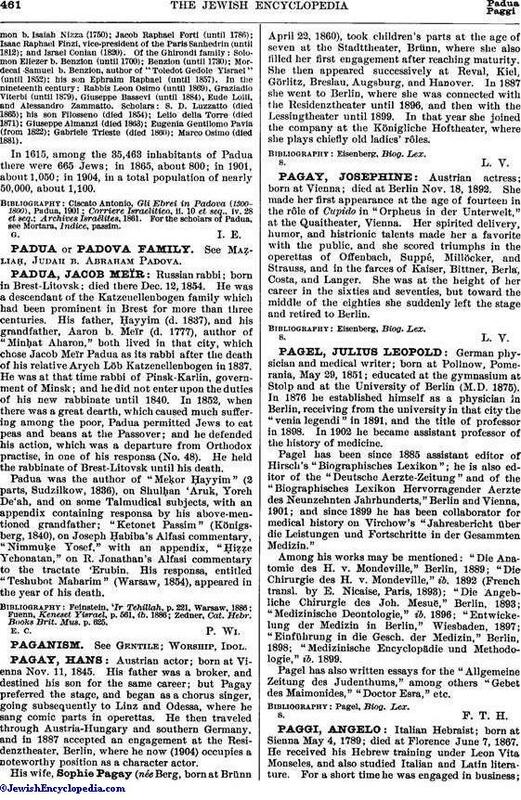 His wife, Sophie Pagay (née Berg, born at Brünn April 22, 1860), took children's parts at the age of seven at the Stadttheater, Brünn, where she also filled her first engagement after reaching maturity. She then appeared successively at Reval, Kiel, Görlitz, Breslau, Augsburg, and Hanover. In 1887 she went to Berlin, where she was connected with the Residenztheater until 1896, and then with the Lessingtheater until 1899. In that year she joined the company at the Königliche Hoftheater, where she plays chiefly old ladies' rôles.